Barcelona Spain, Brethren Colleges Abroad Barcelona, Departure, Gunnoes sausage, lentajas, lentil soup, lentils, mennonite community cookbook, Whatever Happened to Dinner? I have loved lentils ever since I was introduced to them as a college junior living in Barcelona, Spain. The señora at our boarding house cooked them up every couple weeks for an appetizer course, which we cranked up to our dining room using the dumb waiter from the bottom floor of the four story former nun’s convent. Lentils and a chaw of hearty Spanish bread. Yum. The first time I stared at my soup bowl of lentils though, we “Americanas” as we were called informally (the American girls), all puzzled at them a few minutes until one of our Spanish friends supplied the name “lentajas.” Lentils. I suspect we went about tasting them gingerly, but soon they became a welcome and warming soup for most of us on chilly winter days. But I digress. This is not about my year in Barcelona, which I cover quite well in one of my first books, Departure. Recently I had wonderful pork broth left over from the pork roast I posted earlier. The week before the kids came home for Thanksgiving, I cooked up a huge pot of lentils. I had in mind using up my new pork broth, as well as the piddles of savory stuff left after browning our almost weekly favorite Gunnoes sausage, and saved in the freezer for such a time as this. This soup takes about an hour to cook, but is well worth the simmering time, which you can taste and enjoy throughout the low bubbling! My husband and one grandson even seemed to enjoy the pot of lentils thoroughly, although hubby said it’d be good with a few additional vegetables tossed in. That would work too! This version is more savory than previous batches I’d made because of the large amount of pork and sausage broth I used; no actual meat, just the broth. 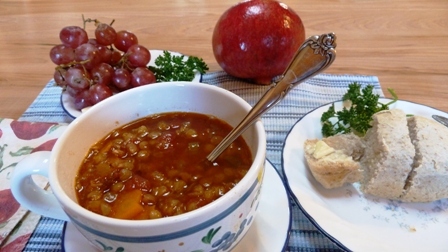 Lentil Soup adapted from various recipes on FoodNetwork. Wash dry lentils and rinse. Set aside. Chop veggies and garlic and brown for 3-5 minutes in olive oil in 5-quart Dutch oven type kettle. 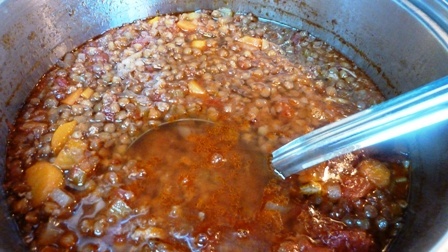 Add broth, lentils, canned tomatoes, and seasonings. Bring to boil. Lower heat to keep it simmering for 50-60 minutes. Lentils, a small but nutritionally mighty member of the legume family, are a very good source of cholesterol-lowering fiber. Not only do lentils help lower cholesterol, they are of special benefit in managing blood-sugar disorders since their high fiber content prevents blood sugar levels from rising rapidly after a meal. But this is far from all lentils have to offer. Lentils also provide good to excellent amounts of seven important minerals, our B-vitamins, and protein—all with virtually no fat. … Just 230 calories for a whole cup of cooked lentils. I often mention my Whatever Happened to Dinner cookbook here but this month I wish to draw your attention to a great classic cookbook on sale for 30% off*, Mennonite Community Cookbook. I had the privilege of shepherding this legacy best-selling cookbook to a 2015 anniversary edition, including researching and writing a new 12-page historical update, as well as new photos throughout. Someone on your Christmas list would likely enjoy it! This page gives various promo codes for a number of books on sale from 30 to 50 to 70% off. I have thought seriously about blogging about soup; your post today confirms my resolve. (Why I could link it to your post today!) I always feel virtuous when I eat lentil soup because I know it’s so healthy. Thank you for including the story about your junior year in Spain with soup delivered via a dumb waiter. Cliff and I stayed in a convent when we went to Rome, but that’s another story too. Will look forward to hearing your convent story–and a soup blog(?) sometime too! I wish I had more than slides of my year in Spain–may have to convert them sometime. 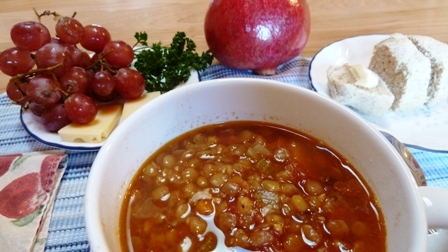 Your comment about virtuous might make a good title too: “Why I feel virtuous eating lentil soup.” Your post plus Bunny Eats Design’s reminds me that not all lentil soup I’ve had is that yummy. I never liked lentils but recently found that not all lentils are equal after I tried some very nice lentils. I wish I had a fond lentil related food memory like yours. I would like to give lentils a go though, I feel childish for avoiding them. Maybe I’ll give your recipe a whirl. You make a very good point that not all lentils are created. I’m not a huge fan of canned lentils as found in the grocery story. They’re much more savory when you add your own broths and seasonings! Thanks for checking this out. I’m very interesting in learning about the Our Growing Edge blog party! Looks like you’ve got a good thing going and I definitely look at my food blogging and photography related as a growing edge–that I enjoy. Thanks for chiming in.